In early January, Casey emailed City Traffic Engineer Linda Marabian and laid out a checklist of remaining work to be done before the All-Star Game. The VoSD didn’t report on where the homeless went who have been displaced from their camp under the overpass. Wherever it is, one hopes that they appreciate it as one of the ancillary benefits of their city getting to host an All-Star Game. Derris Devon McQuaig took legal title to the downtown ballpark away from the city and the Padres two years ago by walking into the San Diego County Recorder’s Office and submitting a properly filled-out deed transfer. This is apparently known as a “wild deed,” and county officials are required to file them even when they are, for example, submitted by someone who clearly just wandered into the recorder’s office and painstakingly researched how to claim title to a major city property. The recorder’s office did notify the district attorney’s office, but the DA’s legal action against McQuaig was tossed out after he was ruled mentally incompetent and involuntarily committed to Patton State Hospital. The actual impact of the deed transfer is expected to be pretty much nothing — one title lawyer worried that “if the report shows that this goofball over here put his name on your property, the bank is not going to lend you money,” but it didn’t cause problems when San Diego recently refinanced the Petco Park bonds — and eventually the city attorney is expected to be able to nullify McQuaig’s deed. So there’s not much here other than the hilarity that the Padres‘ stadium is now officially owned by a mental patient. That’s good enough hilarity for a Monday, though. The average baseball team is now worth $744 million, 23% more than a year ago and the largest increase since we began tracking MLB finances in 1998. 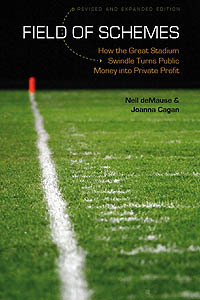 During the 2012 season, revenue (net of stadium debt service) rose 7%, to an average of $227 million per team. Operating income (earnings before interest, taxes, depreciation and amortization) per team fell 9%, to $13.1 million, mainly due to higher player costs and stadium expenses. Yeah, you read that right: Baseball teams are less profitable, but worth more. How’s that work? Forbes doesn’t exactly explain, but does note that both TV rights fees and revenue for MLB Advanced Media (baseball’s online arm) have been soaring, so presumably prospective team buyers are expecting that those revenue streams will keep growing in coming years, enough to outpace increased payroll costs. Though the way things are going there, player costs might just eat up any new revenues faster than owners are anticipating. More likely is that last year’s sale of the Los Angeles Dodgers for $2 billion and the San Diego Padres for $800 million forced Forbes to recalibrate its entire scale upwards. Which is fine enough — new data points should be incorporated into the calculation — but it still doesn’t exactly explain why team values are soaring this much when profits are essentially flat. The one thing that the Forbes numbers make even more clear is that TV and internet broadcast money is king right now: MLB is starting to become more like football, where a larger share of money is generated by people watching at home, rather than the more stadium-revenues-based model it’s traditionally been. How this will affect the business of the sport is complicated: Does it dilute the advantage of teams like the Yankees because everyone now has TV riches at their disposal, or give them more of an advantage because they can expect their cable contracts to outpace their competitors by an even greater margin? Does a team like the Oakland A’s (third to last in team value, but 5th in the league in profits at an estimated $27.5 million) or the Tampa Bay Rays (dead last in value, 19th in profits at $10 million) reconsider its stadium plans if access to eyeballs outweighs ability to put fannies in the seats? If nothing else, one thing should be clear: No teams are moving to San Antonio or Las Vegas anytime soon.